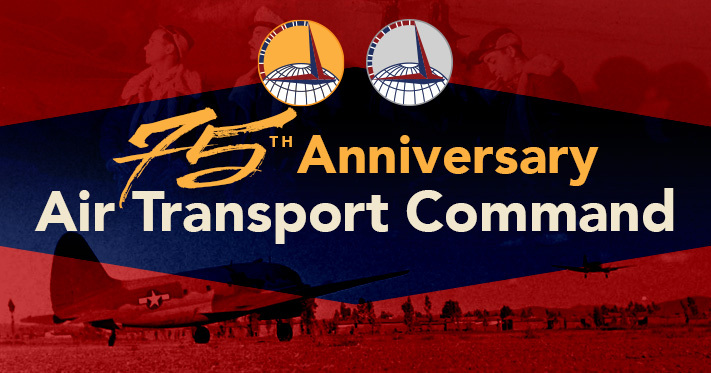 The 75th anniversary of Air Transport Command (ATC) is upon us. It all started with Air Corps Ferrying Command in 1941, ferrying aircraft from the USA to obroad, and was soon renamed Air Transport Command in 1942. It took on the mission of now delivering supplies and equipment to overseas combat theaters and also ferrying aircraft from manufacturing plants to training facilities or for immediate operational use. By 1948, Air Transport Command became the Military Air Transport Service, which was redesignated Military Airlift Command in 1966, and by 1992 became Air Mobility Command. Today, Air Mobility Command takes on the legacy of ATC but on the grander scale of providing rapid support for the U.S. military with global air mobility, and humanitarian support at home and overseas. Hello Air Transport Command and Ferrying Command veterans, families and friends! July 1, 2017 is the 75th anniversary of the formation of the ATC! The ATC Association (ATCA) has been busy. Our 2010 reunion was held at the Air Mobility Command Museum, with 7 veterans in attendance. We noticed that the museum had many indirect references to ATC (for example, exhibits about the Berlin Airlift, medevac, and profiles of WWII officers), but we realized that the story of the Ferrying Command and Air Transport Command had not yet been told. A new ATC exhibit could tie the pieces together. We proposed, helped design, and helped fund and construct the ATC exhibit! It uses uniforms and other artifacts, videos, a slide show, photos, and text to illustrate ATC history and contributions. Our own historian, Sgt. Jack Kinyon, is profiled. The exhibit was dedicated during the ATCA reunion on Armed Forces Day 2016. ATC veterans Jack Kinyon, Edmond Sipowicz, and George Schofield were present for the unveiling and were interviewed. Jack also discussed ATC in an hour-long “hangar talk” slide presentation, open to the public. The Association continues to meet regularly with the goal of spreading the word about the contributions of ATC. Our projects include articles for the AMC Museum’s Hangar Digest newsletter and website; ideas, research, and potential funding for further exhibits at the museum; and presentations to local community groups about ATC. The ATC once had 209,000 service personnel and 104,000 civilians. They helped win World War II and helped develop the modern era of military and civilian air transport. Let’s take a moment to remember those who gave so much, and those who have flown west. Please share this information with interested people and organizations, and please let us know if you are interested in updates or sharing ATC stories in the museum newsletter. Update: Is your name on the bench?